My ancestor John Allen Rankin and his wife Amanda Lindsey, daughter of Edward Buxton Lindsey, have a good story. (See http://digupdeadrelatives.com/category/articles/lindsey-articles/ for my article on the legend concerning Edward Buxton Lindsey.) From one vantage point, John Allen and Amanda’s story is a war story, pure and simple. It is also a love story. The love story and war story intersect in both my family’s legends and the verifiable facts. My father’s “how to” genealogy book advised that the best place to start compiling one’s family history is by interviewing family members. A goodly part of the oral family history is invariably wrong, but even the misinformation contains clues aplenty, says the book. In my experience, the book is dead right. There is a wealth of information in that legend. One of its chief virtues is that its essential objective elements – location, date, a soldier’s uniform, the people involved – are readily subject to verification among actual records. The legend also comes from an unimpeachable source, because Cousin Norene, who was twenty-eight when Amanda died in 1920 and had lived with Amanda for some time, had actually heard that story straight from the horse’s mouth, so to speak. This legend was not subject to the vagaries of multiple oral retellings. When I starting digging around amongst my Rankin and Lindsey relatives, I set about trying to confirm the objective facts about that legend. First, Amanda’s father, Edward B. Lindsey, was living in Monticello, Drew County, Arkansas in 1860. During the war, he was a member of the Monticello “Home Guard,” so he was still in Monticello in 1863. So far, so good – Amanda’s family was right where the legend says they would be in 1863. However, John Allen did not have a sister who was old enough to be married or living on her own when he was knocking on Monticello doors in (according to the legend) 1863. John Allen did have a married older brother, William Henderson Rankin, living in Drew County. William, I discovered as I looked at the 1860 census for Monticello, was listed just a few dwellings down from Amanda’s father Edward B. Lindsey. However, William was still off fighting in the War in 1863. Thus, John Allen was almost certainly looking for his sister-in-law rather than a sister. As legends go, that’s close enough. It is also certain that John Allen was a soldier. My father’s 1969 letter to me continued with the war part of the family legend. When I started writing short articles about my ancestors to preserve the history for our children, I looked for John Allen’s war records among my father’s materials. I couldn’t find them anywhere. Perhaps, I thought, the National Archives had lost John Allen’s records, and Daddy never received anything. Many records from the Civil War have just flat disappeared. However, I had a clear recollection about Daddy telling me about some of the information he learned from those war records. Unable to find anything in his materials, I started sending off for records of my own. Amanda Lindsey Rankin’s Confederate pension application, a certifiable heartbreaker, arrived by mail first. She filed the application from Haynesville, Claiborne Parish, Louisiana in April 1910. She was living with her daughter, Anna Belle Rankin Sale (Cousin Norene’s mother), as of 1900. I cannot find her in 1910, although she was obviously still alive. Amanda signed the application in the quavery handwriting of an old person although she was only sixty-five, which, at this point, doesn’t seem at all old to me. The rest of it, though, is filled out in a strong feminine hand. Amanda swore in her application that she had no source of income whatsoever, no real property, and no personal property worth a spit. That is all unquestionably true, from what I know of my north Louisiana relatives: that didn’t change until my father’s generation. She certainly couldn’t get much help from her son John Marvin (“Daddy Jack,” my grandfather), who at that time was struggling to make ends meet with a wife and four children, a rented house, and a job driving a dray wagon. Amanda stated further that John Allen volunteered to serve the Confederate Army in Pine Bluff, Arkansas on March 14, 1862 (turns out that was the wrong year), that Captain Henry was his company commander, and that he was in the 9th Arkansas Infantry. She also swore – under oath, mind you – that he was honorably discharged on April 10, 1865, which just happens to be one day after Lee surrendered at Appomattox Court House. Here we have an apparent disconnect between the legend and the pension application. The legend says that John Allen and Amanda met in 1863. Amanda swore that he was discharged two years later. The Office of the Board of Pension Commissioners of the State of Louisiana sent Amanda’s application off to the War Department in Washington, D.C. The War Department had this to say in response. I don’t think Amanda ever knew the truth about her husband John Allen’s service, unless she figured it out after her pension application was denied. What do you think? I wonder who came up with a discharge date one day after Appomattox? In my imagination, which badly wants to give the destitute Amanda the benefit of the doubt, some nice female clerk was helping Amanda fill out the application (it is, I surmise, her handwriting on the forms, although it might have been Amanda’s daughter, Anna Belle Rankin Sale). The clerk asked when John Allen was discharged, to which Amanda responded truthfully that she did not know. The clerk, who knew her history, said, “well, everyone was discharged by April 10, 1865, why don’t we just use that date.” Fine, said Amanda. The clerk naturally assumed that John Allen received a normal discharge, or why else would Amanda even bother to apply? John Allen’s entire military record arrived in the mail shortly thereafter. Here are the facts, along with some great images from records that are more than 150 years old. Ironically, when I retrieved these records from my own notebooks, I found my father’s copies stashed in the same clear plastic page cover. So I have a spare copy of these records, if anyone in the family needs one! Amanda did have some of the facts about her husband’s war record down pat. John Allen Rankin did enlist in the Confederate army at Pine Bluff, Arkansas – near where his family farmed, in Jefferson (now Cleveland) County. He was a private, and is shown as having served in both C and K companies of the 9th Arkansas Infantry. He enlisted for a one-year term on July 25, 1861 and served under Captain Henry. At Champion Hill, about 4,300 Confederate soldiers and 2,500 Union soldiers were casualties. That battleground is just east of Vicksburg, where the main action took place. It was considered a Union victory and an important battle in the Vicksburg campaign. I find it difficult to grasp applying the term “victory” to that carnage. On our way home from a trip to the Tennessee Archives in Nashville, Gary and I drove around the area of the battle of Champion Hill, a backwoods area east of Vicksburg. It has been almost entirely forgotten by history: no park, no historical markers, nothing except a decent-sized stone monument where Confederate Brigadier General Leonard Tilghman died. The problem, in case you cannot read that record: “diarrhea, acute.” Can’t say that I am surprised. I’d have diarrhea, too, if someone had been shooting at me, and I was getting a pretty good fix on which side would win, and the Confederate general in charge at Champion Hill had — incredibly — marched my unit piecemeal straight into Sherman’s entrenched troops. However, the records certainly don’t provide any support to the “war wound” theory that somebody in the family concocted to explain John Allen’s reluctance to talk about The War. And that was the last the CSA saw of my great-grandfather John Allen Rankin, who evidently just walked away. His original enlistment for twelve months was long up. By November 1, 1863, he was listed as absent. They finally quit carrying his name on the muster roll after December 1863. It probably wasn’t too long after he was paid in Selma in October 1863 that John Allen met his future wife at the front door of Edward B. Lindsey’s home in Monticello, Arkansas. That had to have been about the middle of November 1863, assuming he made about twenty miles per day on the 400-mile walk from Selma to Monticello. With that, the legend turns happy. He was wearing an almost brand-spanking new uniform, he was the most handsome soldier Amanda had ever seen, and she fell in love with him on the spot. Here are the last two records – “muster rolls,” a regular record of who showed up in a military unit at periodic intervals – for John Allen’s Confederate service. The last record says “absent in arrest in Canton by order of Provost Marshall.” That means the equivalent of an arrest warrant was issued after he was declared AWOL. John Allen never did any time in the pokey, or there would be other records in his file. By the time that AWOL order was issued, he was undoubtedly already in Monticello, Drew County, Arkansas, making Amanda Addieanna Lindsey swoon. I once had a huge Rankin portrait that hung in my grandmother Rankin’s house in Gibsland, Bienville Parish, Louisiana, where my father graduated from high school in 1925. My cousin Ellis Leigh Jordan (son of Aunt Louise Theo Rankin Jordan) gave it to me in consideration of my promise to photograph or somehow reproduce it for all the Rankin cousins. The man in the photograph is definitely good looking – no big ears or nose like his son John Marvin. He did have the classic male Rankin receding hairline and “topknot” that is shared by the Lincoln County, NC Rankins. He had a fabulous mustache. My Rankin cousins were unanimous that our grandmother positively identified this man as a Rankin, but the cousins don’t know which Rankin he is. We all agreed that the picture cannot possibly be our grandfather John Marvin (“Daddy Jack”) Rankin. It follows that it must be John Allen or his father Samuel Rankin. However, it cannot conceivably be John Allen’s father Samuel, who died in 1861-62. The quality of the photograph was just too good, and Sam hadn’t been as young as the man in that picture since the 1840s. Besides, it seems highly unlikely that our grandfather would display a huge portrait of his grandfather, rather than his father, in his parlor. That photograph must have been John Allen Rankin, probably in the early 1880s at about age forty, not long before he died. Unfortunately, that fabulous photograph was lost, which breaks my heart. I would pay a small ransom to have it back. Back to the story. In 1870, John and Amanda were living in Homer, Claiborne Parish, with their two eldest children, Anna Belle Rankin, age three, and Samuel Edward Rankin, age one – the latter undoubtedly named for his two grandfathers, Samuel Rankin and Edward Buxton Lindsey. John Allen and Amanda listed $400 in real property and $350 in personal property in the census enumeration, and John Allen identified himself as a farmer. They apparently owned some land, although I cannot find a deed of purchase or a land grant to John Allen. I do know, however, that he and Amanda sold nine acres in Claiborne Parish for $33 in August 1870. The sale of land is perhaps a clue that farming did not work out well. By 1880, John Allen and Amanda were living in Webster Parish. John Allen, age 36, was Deputy Sheriff. By 1880, he and Amanda had six children, including my grandfather John Marvin “Daddy Jack” Rankin, who was born in 1875. Their seventh and last child, Mary Alice, was born in September 1880, too late to appear in that census. The deputy sheriff job apparently did not work out well, either. A letter that was saved by the family of John Allen’s brother Elisha Rankin reported that John Allen and family went through Homer in October 1882 on their way to Blanchard Springs (north of Shreveport) to run a barber shop. I don’t know what happened to the barber shop, but the Rankins wound up moving back to Claiborne Parish, where they stayed. The next thing you know, John Allen was six feet under. According to Amanda’s pension application, John Allen died of “congestion of the brain,” an obsolete medical term. It most likely means that John Allen had a stroke. He was only forty-five years old. There were five children age fifteen and under still at home. Amanda obviously did not have an easy time thereafter. She expressed her anguish in a letter she wrote to one of John Allen’s brothers, Elisha (nickname “Lish”) Rankin, and Elisha’s wife Martha, who lived in Arkansas. Amanda wrote the letter three months after John Allen died on Sunday, October 13, 1888. She was forty-four years old. Here is a transcription, with spelling and punctuation (or lack thereof) exactly as transcribed, and question marks where the language is uncertain or totally illegible. “Dear Brother and Sister, it is with pleasure tho a sad heart that I try to answer your kind letter I received some time ago Would have written sooner but I was in so much trouble I could not write soon We had to move Dear brother you have no idea how glad I was to get a letter from you I feel like one forsaken My happiness on earth is for ever gone of course I know you grieve for the Dear (?) house (?) but oh what is the grief to be compared to misery when a woman loses her husband. How sad I feel today for the dear one was a corpse on sunday. how long seems the days and nights to me. Brother Lish you wanted to know how we are getting along We are in det over one hundred dollars and no hom. I have moved to Mr. Weeks to work on ????? Jimmy Burton my Nephew is going to ??? after the little boys and show them how to manage this year. Eddie [Amanda’s son, Samuel Edward] is at Harrisville [Haynesville?]. I could not depend on him to ?????? He is not settled yet. I will ???? ???? me and the children a longe time to pay our det. It was the oldest children that caused me to be so bad in det. If I was young and able to work I would feel like maybe in two or three years we wold get out of det. I will do all I can to help the boys make a crop. Joe [Amanda’s son, Joseph D. Rankin] is 16 but he don’t now how to work much. I have got a few hogs and cowes all I have got. Annie and Lula [her daughters Anna Belle and Lula, both of whom married men named Sale] married brothers. They have got good homes. They live 3 miles from me. They live in site of each other. Brother Lish I am a fraid you cant read this. It has been so long since I wrote a letter. Give Mother my love [presumably, “mother” refers to Mary Estes Rankin, the mother of John Allen and Elisha] and tell her to pray for me that I ???? ???? my children ???? I will have to be Father and Mother both. Give my love to all the connection and tell them to write. My love to Martha and the children write soon and often I remain ever ?????? ???? Sister. Goodness gracious. Her anguish is overwhelming. Wouldn’t you like to see Elisha’s reply, if any? I wonder how he handled Amanda’s letter. Did he read it as a plea for funds? Or did he just see it as someone describing her feelings in the context of a desperate financial situation and emotional loss? No telling. May you rest in peace, Amanda and John Allen. Both are buried in the “Old Town” Haynesville Cemetery in Claiborne Parish, Louisiana. Be careful if you visit there – no matter where you step, I will guarantee you are treading on someone to whom I am related at least by marriage! John Allen had two sisters, Mary and Elizabeth (“Lizzie”) Rankin. 1860 census for Jefferson Co., AR, p. 848, dwl. 549, listing for Samuel Rankin included Mary Rankin, age 10; 1870 census, Jefferson Co., AR, p. 575, dwl. 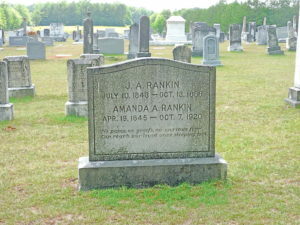 17, listing for Mary F. Rankin (Sam’s widow) included Elizabeth Rankin, 8. The elder daughter, Mary, would only have been about thirteen in 1863. Jennie Belle Lyle, Marriage Record Book B, Drew Co., Arkansas (Little Rock: Democrat Printing & Lithography Co., 1966), William H. Rankin, 20, married Eliza Jane Law, 21, July 1, 1858. 1860 census, Drew Co., AR, p. 101, dwelling 155, listing for William Rankin and p. 103, dwelling 167, E. B. Lindsey. 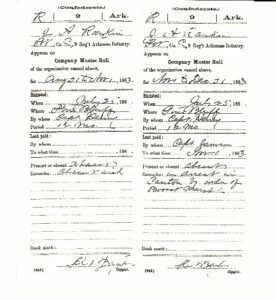 William H. Rankin’s service record at the National Archives indicates that he enlisted from Monticello in the Confederate Army on 8 Feb 1862 for three years or the duration of the war. He was listed as present on his company’s muster roll through Oct. 31, 1864. 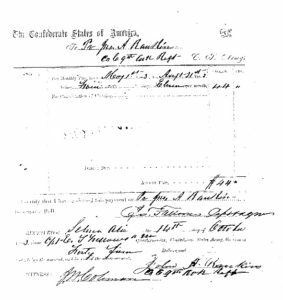 Louisiana State Archives, “Widow’s Application for Pension” of Amanda A. Rankin, widow of John A. Rankin, P.O. Haynesville, LA, filed 4 Apr 1910. 1900 federal census, Haynesville, Claiborne Parish, LA, p. 55, household of A. C. sale with mother-in-law Amanda Rankin, wife Annie Sale, and children. That’s not accurate, of course. Some fighting continued after Lee’s surrender on April 9. 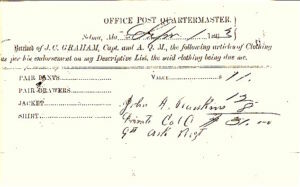 National Archives and Records Administration, Washington, D.C., Civil War record for Rankin, John A., Companies C and K, Arkansas Infantry, Private. I will add a brief description of the Battle of Champion’s Hill at the end of this article. On second thought, I will write a separate article about that battle. Unfortunately, John Allen’s portrait is now lost, as is a portrait of his mother, Mary Estes Rankin, which was taken at the same time, in (probably) the early 1880s. 1870 census, Claiborne Parish, LA, Homer PO, p. 59, dwl #39, listing for John A. Rankin, 27, b. MS, Amanda Rankin, 25, b. MS, and the two children, both b. LA. LDS Film # 265,980, Claiborne Parish Deed Book J: 226. 1870 census, Webster Parish, LA, p. 219, dwl 255, J. A. Rankin, wife Amanda Rankin, and children Anna Belle, Edward, Lulu, Joseph, Marvin, and Melvin. Letter from Washington Marion Rankin (“Wash”), who lived in Homer, to his brother Napoleon Bonaparte (“Pole”) Rankin dated October 1882. I do not own, and have never seen, the original of this letter. I obtained a transcription from Megan Franks, a descendant of Elisha Rankin, John Allen’s brother. Another distant cousin reportedly owns the original of Amanda’s letter, as well as several other Rankin letters from the 1880s. I have called and written him (he lives here in Houston) but he never responded. That is a shame, because I could probably clarify some of the “X”ed material.